Mega Bloks Create ‘n Play Junior Endless Building Set is a must have for little builders! These tubs include everything that a child needs in order to have lots of creative fun with endless building possibilities. Once you are done building and playing, you can display your creations on the tub or store your blocks away in the tub for your next building adventure. This toy costs approximately £14.99 (for the latest and best prices make sure you check our retailer list for the Mega Bloks Create ‘n Play Endless Building Pink above). 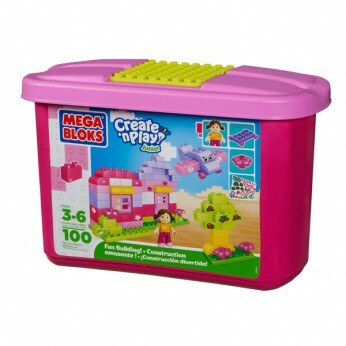 In our review of Mega Bloks Create ‘n Play Endless Building Pink we classed it as being suitable for ages 1 to 3 years but recommend you check the manufacturer specific advice before purchasing.